Collection of Analyses frequently ordered together for the same sample types. By storing the collection of analyses in a profile, these can be re-ordered for many samples through one click in stead of having to select all the analyses one by one. 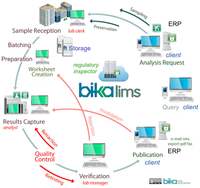 Bika uses AR 'Batching' to group analysis requests together where this makes sense, often for Work Orders, Projects, Experiments etc. 'Controls' or standards used to check the quality and metrological traceability of products, to validate analytical measurement methods, or for the calibration of instruments. Software that integrates departments and functions across a company into one computer system, enabling various departments to share information and communicate with each other. The lowest concentration at which the analyte can not only be reliably detected but at which some predefined goals for bias and imprecision are met. RFID uses electromagnetic fields to identify and track tags attached to objects, mostly Samples in LIMS context. The tags contain electronically stored information. A software delivery model in which a professional service provider hosts applications and makes them available to customers over the Internet who pay per usage or subscription. SaaS is one of three main categories of cloud computing, alongside infrastructure as a service IaaS, and platform as a service PaaS. SaaS provides a complete software solution which you purchase on a pay-as-you-go basis from a cloud service provider. You rent the use of an app for your organisation and your users connect to it over the Internet, usually with a web browser. Set of materials from which a sample type can be associated with in order to correctly derive a testing methodology. In Bika Senaite, Sample Types expand on these matrices with a finer granularity. The fourth major industrial era since the initial Industrial Revolution of the 18th century, a range of new technologies that are fusing the physical, digital and biological worlds, and impacting all disciplines, economies, and industries. In fields such as artificial intelligence, robotics, the Internet of Things, autonomous vehicles, 3D printing, quantum computing and nanotechnology.